Got a groovy idea to do a good thing in our community? Do you need up to £1,000 to make your idea happen? What sort of things can you pitch for? We welcome pitches from people in Llandrindod Wells and the surrounding villages who have ideas that will benefit our community in some way. It could be something simple that makes people in our community happy or a business idea that will bring money into our community. Let your creative juices flow, bring us your ideas and apply to pitch for funds. PLEASE make sure you tell us how you could spend up to £1,00 in your application to pitch. 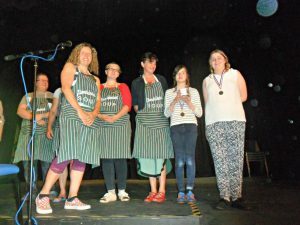 Thumbs Up Club were our first winners way back in June 2015. They used their funds to take the youngster they support to the seaside where they enjoyed delicious fish and chips on the beach. 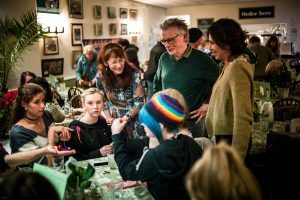 Pow ysYoung Carers made a brilliant pitch for funds to buy games and activities for their social nights where young people get a break from their caring responsibilities. Play Radnor gave the most energetic pitch we’ve seen and the audience rewarded them with their votes so they could commission local artists to transform some ugly fence panels around a prominent site in the town. A couple of young local entrepreneurs pitched for funds to buy new equipment for their business The Popcorn People. 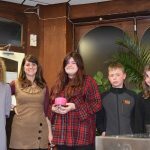 They started trading in 2015 at the Llandrindod Youth Market selling flavoured popcorn and used their winnings to buy a crepe maker to expand their trading. SOUP isn’t just about winning the money you pitch for. 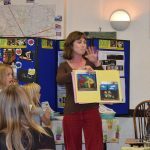 One pitcher asked for funds to make curtains for a new community education centre in Newbridge on Wye. Whilst she didn’t win the SOUP money, she went away with offers of material and people to make the curtains which meant that she achieved her project anyway! 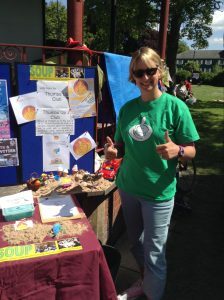 In June 2016 at the Big Lunch it was the turn of Happy Hampers to win our SOUP pot to fund goodies to go into the hampers they make to give to older people at Christmas. What wonderfully generous youngsters our town has! 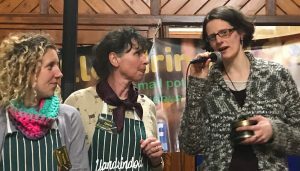 In October 2016 we had two winners at our SOUPer Bowl event – Llandrindod Pomarium funded a Wassail and Bandrindod were able to cover some of their running costs. So we did SOUP at the Fringe and we had loads of entries. We funded some mindfullness sessions with Mike and Mid Powys Mind’s memory Cafe. 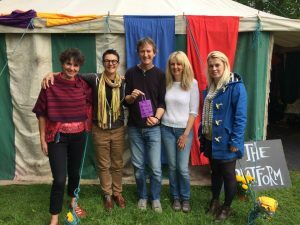 Those give aways took our giving over the £1,000 mark too – what a great festival! 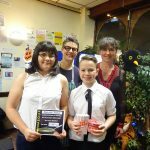 We loved having Mid Powys Youth Theatre at December 2017 SOUP where they pitched for and won funds to put towards a new lighting gantry. In return for those funds they went off and performed for some older people at a home in the town – brilliant! 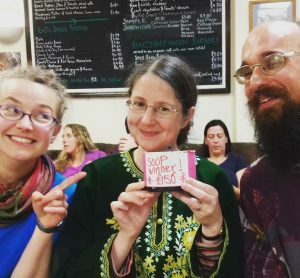 In early 2018 we held our first ever on line SOUP called Random Acts of Kindness and funded by Arvon Ales and Love Sound Ltd. There were two winners – Tremont Wombles used their cash to plant up the roundabout on their estate and Sally went off to research how to build a dog poo powered street light. 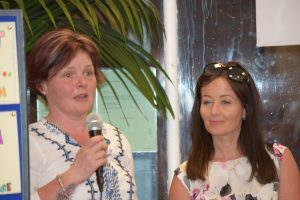 As summer approached, Llandrindod Carnival were pleased to win their cash injection to help bring in some crowd pleasing entertainment to the town carnival. This SOUP took the total we’ve given away over £2,000! 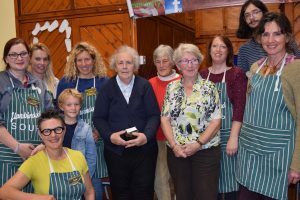 At September SOUP we were able to announce the winner of our second on-line SOUP funded by Trawsnewid Llandrindod Transition. Helping Our Homeless took away £100 which will go towards a freezer to enable more surplus food to be made into meals for homeless people and Food Bank users. 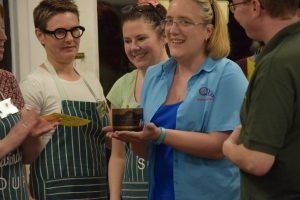 We also had two SOUP winners that night as the votes were tied! Llandrindod Rocks will now be able to fund a big rock painting session and Dorene, Carol and Pat the Radnor Wildlife Trust gardeners will be buying plants to supplement the gardens they maintain around the town. 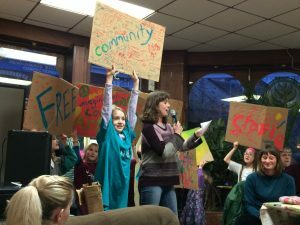 At December SOUP, we were so pleased that Caroline Andrews came along and talked about how we can help tackle period poverty and cut down on the huge amount of materials used to deal with periods by making your own ‘moon pads’. She obviously struck a chord with our audience because she won the vote and took away £130. Caroline has used the cash to buy materials for a workshop on how to make your own equipment.